It’s been said that time and tide wait for no man. li Bernstein Saylor/Boulder City Review The sun sets over the Pacific Ocean on Nov. 7 at Hobson Beach Park in Ventura, California. Fortunately, in my case, I was able to take advantage of a bit of extra time last week as Daylight Saving Time ended to watch the tides roll in and out. Sitting on the beach, listening to the waves crash, is one of the best ways I have found to use that extra hour when you set the clocks back each year. Time may not wait, but having a bit more of it once a year is awfully nice — especially with our hectic schedules every day. Since my birthday is in the beginning of November, my husband and I take advantage of the timing to extend our celebration. And, for the past several years, we have been making a pilgrimage to the Pacific coast. 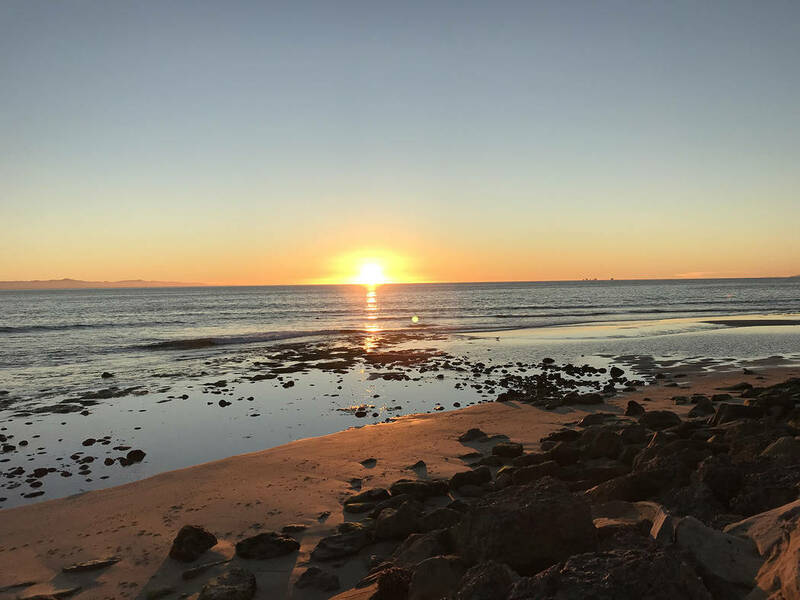 It seems as if the tide waits for us to arrive each year, offering extra soothing ocean sounds, cool breezes and spectacular sunsets. Or it could just be that the setting alters our mindset, allowing us to slow down and enjoy the sights and sounds around us. This year, we camped just a few feet away from the sandy beach. We had ample time and opportunity to watch the tides come in and go out, and explore the nearby beach and tide pools. It also reminded us to make the time to relax a bit more often and enjoy the simple things in life: spending time with loved ones, standing still long enough to witness nature’s bounty and beauty, and a sitting around a comforting campfire at night. When I returned home, I was refreshed and re-energized. I was ready to tackle life’s daily challenges. It made me wonder why don’t we do this when we are not on vacation? I know there are spectacular sunsets in the desert. I’ve seen beautiful cactus blooms and amazing vistas. And the vast, open spaces, with their stillness or whispering winds, can be equally soothing. It’s true that time and tide wait for no man — or woman. And, if more appropriately interpreted, mean that no one is powerful enough to stop the march of time or that if you don’t take a chance when opportunity knocks, you may never get that chance again. Either way, there’s some sound advice there. We all need to make the time to put aside the pressures of work or unpleasant situations — even if only for an hour every now and then. How you decide to use that time is up to you. Make the choice to find your own personal oasis. Stop for a second to marvel at the hummingbird sipping from the flower in your yard or how the colors in the sky change from pink to red to orange as the sun sets. Call or text your significant other to let them know how much you care. Find a friend to enjoy a cup of tea or glass of wine with. Get a good book to get lost in. Choose whatever you love most, whatever puts a smile on your face. I suspect that giving ourselves a gift of a little time, taking advantage of the opportunity to enjoy simple pleasures and letting our chores and obligations wait a bit, will change the tides of our life for the better.